PLEASE CALL US AT 844.562.4900 TO PLACE YOUR ORDER!! National Document Solutions LLC is your recommended dealer for stock continuous and laser Repair Orders. 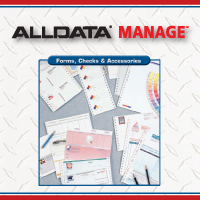 Because we work closely with ALLDATA® MANAGE℠, we know that our high quality printed products are compatible with your ALLDATA® MANAGE℠ software program. Our prices are competitive and we guarantee that your ALLDATA® MANAGE℠ forms will work in your printer and align with your software or we will cheerfully refund your money. If you have any questions or if you need assistance in using the site, just call our customer service representatives at 844.562.4900 and they will be happy to assist you. Note to our Canadian customers: Please call our Customer Service Department at 844.562.4900 for product inquiries and orders. Thank you!